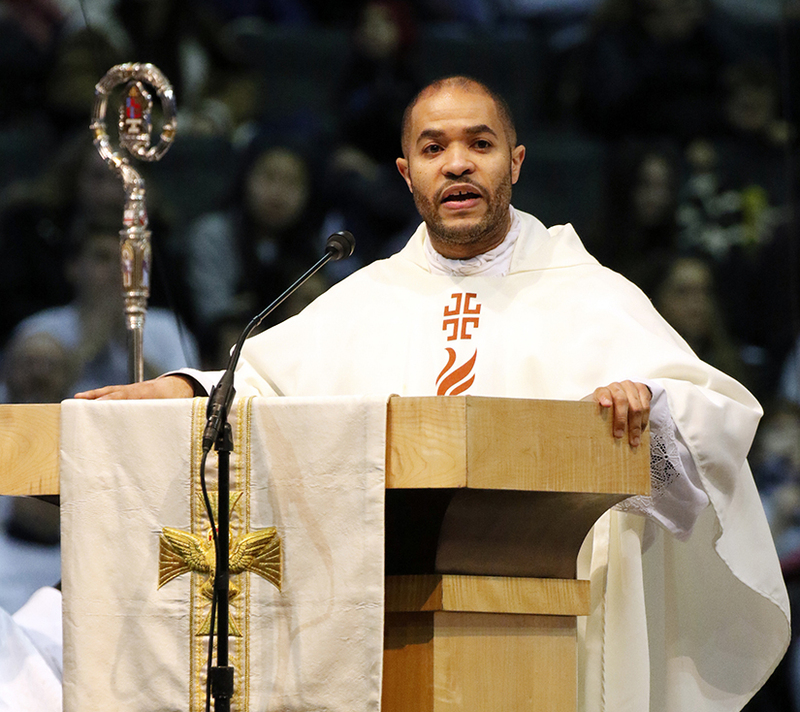 Father Robert Boxie of St. Joseph Parish in Largo, Md., delivered the homily at the Mass for Life at Capital One Arena in Washington Jan. 18 before the annual March for Life. VATICAN CITY — The percentage of Catholics in the world has remained steady, while the number of priests has decreased for the first time in almost a decade, according to Vatican statistics. Meanwhile, the numbers of bishops, permanent deacons, lay missionaries and catechists have all increased, it stated. At the end of 2017, the worldwide Catholic population exceeded 1.3 billion, which continued to be about 17.7 percent of the world’s population, according to a statement published March 6 by the Vatican press office. The statement reported a handful of the statistics in the Statistical Yearbook of the Church, which reported worldwide Church figures as of Dec. 31, 2017. The press office also announced the publication of the 2019 “Annuario Pontificio,” a volume containing information about every Vatican office, as well as every diocese and religious order in the world. According to the statistical yearbook, the number of Catholics increased in every continent. But while that growth in Africa and the Americas kept pace with their respective region’s population growth, Asia showed a 1.5 percent increase in the number of Catholics while the region’s population grew less than 1 percent. At the end of 2017, most of the world’s Catholics (48.5 percent) were living in the Americas, followed by Europe with 21.8 percent, Africa with 17.8 percent, 11.1 percent in Asia and 0.8 percent in Oceania. The yearbook showed the number of bishops in the world continued its steady increase over the past six years, going from 5,133 in 2012 to 5,389 in 2017. For the first time since 2010, according to the Vatican statement, the total number of priests — diocesan and religious order — around the world decreased, going from 414,969 in 2016 to 414,582 in 2017. Ordinations of diocesan priests continued to decline slowly from 6,577 in 2012 to 5,815 in 2017. The number of brothers in religious orders continued a steady increase only in Africa, as Asia continued a recent downturn that began in 2016. The number of religious brothers worldwide was down to 51,535 in 2017 from 52,625 in 2016. The number of women in religious orders showed an ongoing downward trend of about a 1.6 percent decrease each year worldwide since 2013, the yearbook showed. The slight increases in Africa and Asia weren’t enough to offset the reductions in Europe, the Americas and Oceania. Catholic women’s orders went from having more than 792,000 members in 2001 to just over 648,910 women at the end of 2017. The number of candidates for the priesthood — both diocesan seminarians and members of religious orders — showed a continued slight decline worldwide, decreasing from 116,160 at the end of 2016 to 115,328 at the end of 2017. The number of permanent deacons reported — 46,894 — was up 582 over the previous year. The vast majority — 97.3 percent — of the world’s permanent deacons live in the Americas and in Europe. The number of lay missionaries worldwide increased by over 1,000 people to 355,800 and catechists were up by 34,000 people to 3.12 million by the end of 2017. There were more than 15.6 million baptisms around the world in 2017 and more than 2.3 million Catholic weddings.